I shall content myself with relating the history of St. Stanislaus, Bishop of Cracow, Poland, who restored a man to life who had been dead for three years, attended by such singular circumstances, and in so public a manner, that the thing is beyond the severest criticism. ... This incident was known by countless persons and by all the court of King Boleslaus II (reigned 1058-1080). 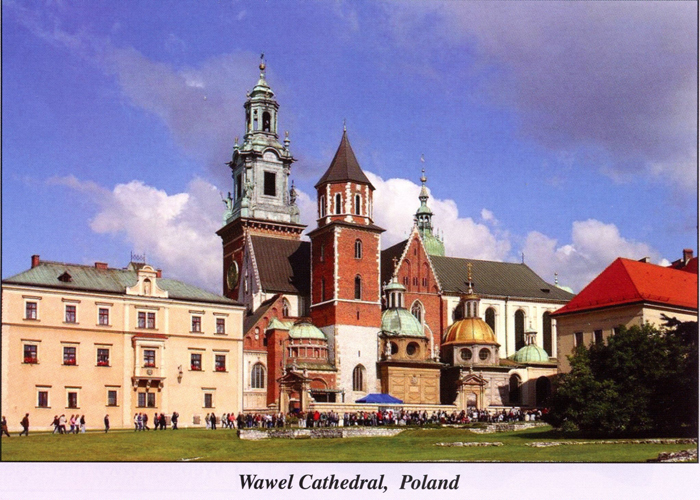 St. Stanislaus, bought an estate from a man named Piotr [Peter], for the use of his church at Cracow. This estate was situated on the banks of the Vistula in the territory of Lublin. The Prelate gave the full price of it to the seller. This was done in the presence of witnesses, and with the solemnities required in that country, but without written deeds, for written accounts of transactions of this kind were seldom made in Poland at that time. They contented themselves with having witnesses. Stanislaus took possession of this estate, and his church enjoyed it peaceably for about three years. In the interim, Peter, who had sold it, happened to die. The King of Poland, Boleslaus, had conceived an implacable hatred against the holy Bishop because he had frequently reproved him for his excesses. Therefore, seeking to cause him trouble, the King excited the three sons of Peter, his heirs, against their father and told them to claim the estate which their father had sold, on the pretence that it had not been paid for. He promised to support their demand, and to cause the estate to be restored to them. Thus these three men had the Bishop cited to appear before the King, who was then at Solec occupied in rendering justice under some tents in the country, according to the ancient custom of the land, in the general assembly of the nation. The Bishop was cited before the King, and maintained that he had bought and paid for the estate in question. The day was beginning to close, and the Bishop ran great risk of being condemned by the King and his counsellors. Suddenly, as if inspired by the Holy Spirit, the Bishop promised the King to bring Peter before him in three days, the deceased man who had sold it to him. The condition was accepted mockingly. The holy Bishop retired to his Church a distance away, where he prayed and fasted with his household for three days. On the third day, he went in his pontifical robes, accompanied by his clergy and a multitude of people, ordered the gravestone to be raised, and made them dig until they found the corpse of the defunct, all fleshless and corrupted. Then St. Stanislaus commanded him to come forth and bear witness to the truth before the King's tribunal. The Bishop touched the bones with his crosier and they filled out with flesh. The dead Peter rose; they covered him with a cloak. The Saint took him by the hand and led him alive to the feet of the King. No one had the boldness to interrogate him. But Peter himself spoke out freely, and declared that he had in good faith sold the estate to the Prelate and that he Jiad received the value of it. After stating this, he severely reprimanded his sons, who had so maliciously accused the holy Bishop. Stanislaus asked Peter if he wished to remain alive to do penance. Peter thanked him, and said he would not expose himself anew to the danger of sinning. Stanislaus returned him to fiis tomb, where he again fell asleep in the Lord. It may be supposed that such a scene had numerous witnesses, and that all Poland was quickly informed of it. The King was only the more irritated against the Saint. Some time after, he killed the Bishop with his own hands as he was coming from the altar in Wawel Castle outside the walls. The King slays the Bishop with his sword of Cracow. He then ordered that the Prelate's body be hacked into 72 pieces so that they might never be collected together to be paid the honor due to them as the body of a martyr for the truth and for pastoral liberty. 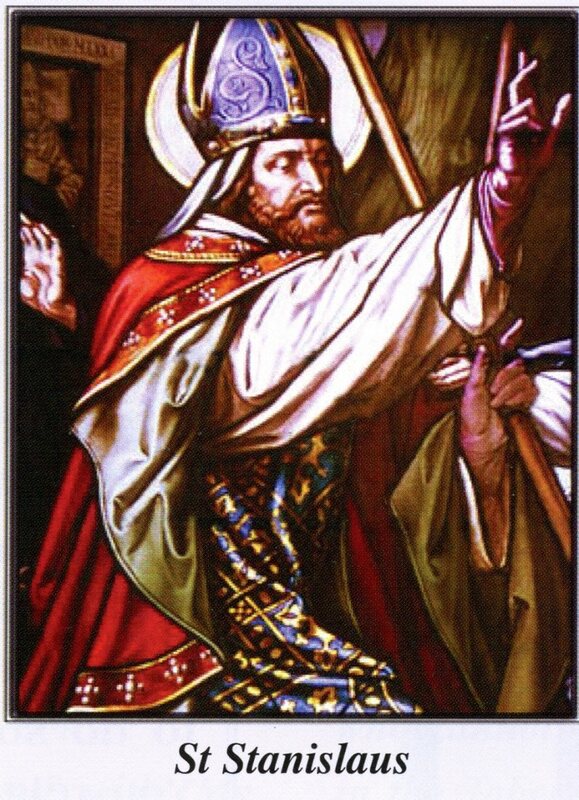 St. Stanislaus was canonized in 1253 by Pope Innocent IV. He is the patron of Poland and of the city and Diocese of Cracow, and is invoked in battle.